F.J. Pierce, P. Nowak, and P.C. Roberts, Aspects of Precision Agriculture. N.S. Bolan, R. Naidu, J.K. Syers, and R.W. Tillman, Surface Charge and Solute Interactions in Soils. Inderjit and K.I. Keating, Allelopathy: Principles, Procedures, Processes, and Promises for Biological Control. R.R. Duncan and R.N. Carrow, Turfgrass Molecular Genetic Improvement for Abiotic/Edaphic Stress Resistance. Advances in Agronomy continues to be recognized as a leading reference and a first-rate source of the latest and best research in agronomy. As always, the topics covered are varied and exemplary of the panoply of subject matter dealt with by this long-running serial. Volume 67 contains four comprehensive and timely reviews on topics in the crop and soil sciences. 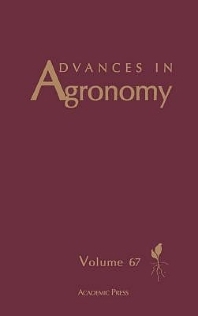 Chapter 1 addresses one of the most active areas in agronomic research--precision agriculture. Chapter 2 is a thoughtful review on surface charge and solute interactions in soils. Chapter 3 thoroughly covers advances in the use of molecular genetics to enhance abiotic/edaphic stress resistance in turfgrass. Chapter 4 is a useful review on a topic that is of great interest to agronomists--allelopathy. Professionals and students in the fields of agronomy, plant, soil, and environmental sciences.